Hamburger/Chicken/Tuna Helper as Low as $0.67 at Target! 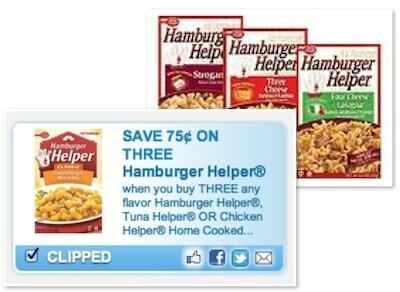 Print out your Hamburger Helper printable coupon to save $0.75 on 3 boxes of Hamburger, Chicken or Tuna Helper or get your $1 off 3 Hamburger Helper coupon from the 8/19 Smart Source coupon insert and bring it to Target to get a nice deal! This week, Hamburger Helper, Chicken Helper and Tuna Helper are all on sale for $1 each at Target. Use you coupon and get 3 boxes for as low as $0.67 each! I don't know if I've ever had Hamburger Helper, but I do love the Alfredo Chicken Helper. I've also had both my sister and my mother-in-law make two different but equally tasty soups using Hamburger Helper as a base. I'll post the recipes as soon as I can get them to share a quick meal!